Our short voyage to Falmouth proved to be a very happy reminder of what it's all about. 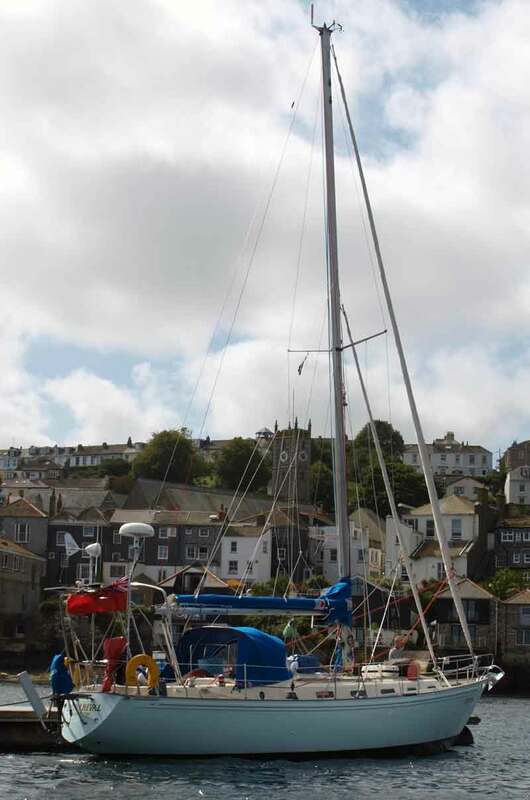 The winds were gentle, we avoided getting cold and wet, and the staff at the Falmouth Yacht Haven were most welcoming. Once safely berthed we were well looked after by Liz and Anne Hammick. Both have a wealth of cruising experience. With Mark Scott, Liz sails Lone Rival, a non-identical twin of Lynn Rival, and Anne, a hard-working author and editor, is a mine of information about our proposed cruising ground. Apart from yet more last minute fitting out and snagging, whilst in Falmouth we were distracted by visits to the spectacular National Maritime Museum. Lynn Rival's hijack features in their Search and Rescue exhibition and they asked us to donate some memorabilia. No longer do we have a pirate's dagger and flip flop on board ... just the bullet hole in the boom. Last minute panics included not being able to get the Iridium comms system working - what use is that big white mushroom on the back? - and Paul drilling a hole through the Sea-me cable - ditto for thing sticking up at top of mast. Getting the HF radio wired up and the new toy (AIS transceiver) working became a priority. In the meantime, close watching of the weather forecast suggested Saturday 15th September would be a good time to go. Not least we tropical cruising wimps were beginning to feel the cold at night. Chris Leivers (Paul's nephew) came to join us for the passage and after a busy day Malcolm and Pauline Wakely saw us off in their rib as far as Black Rock. Setting off on a passage is always exciting but there's plenty to think about. 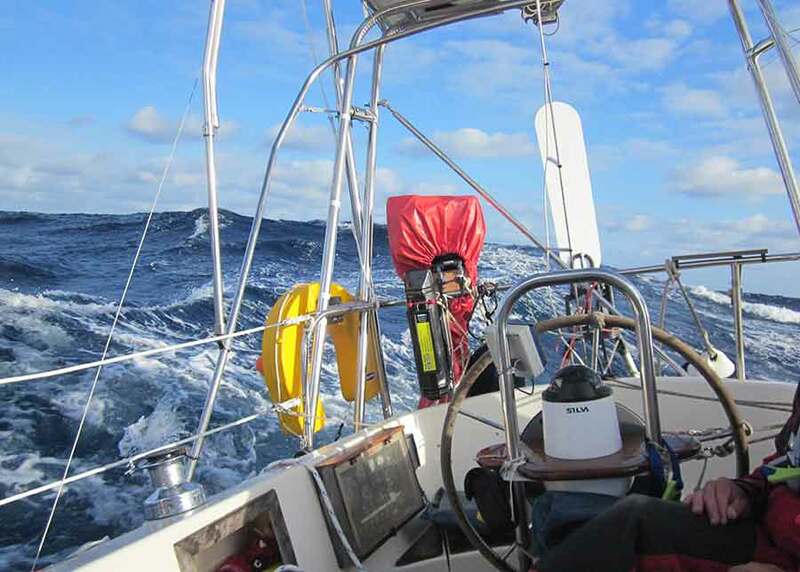 Weather forecasts for Biscay can't be relied upon beyond a few days. Many sailors talk of uncomfortable crossings. At least with 3 of us on board we would have longer off-watch periods to look forward to. 4 hours on and 8 hours off is luxury compared to our normal 4 on, 4 off. Our plan was conventional - to make a good westing as early as possible to reduce the risk of being set into the shallow waters of the bay by the prevailing westerlies. 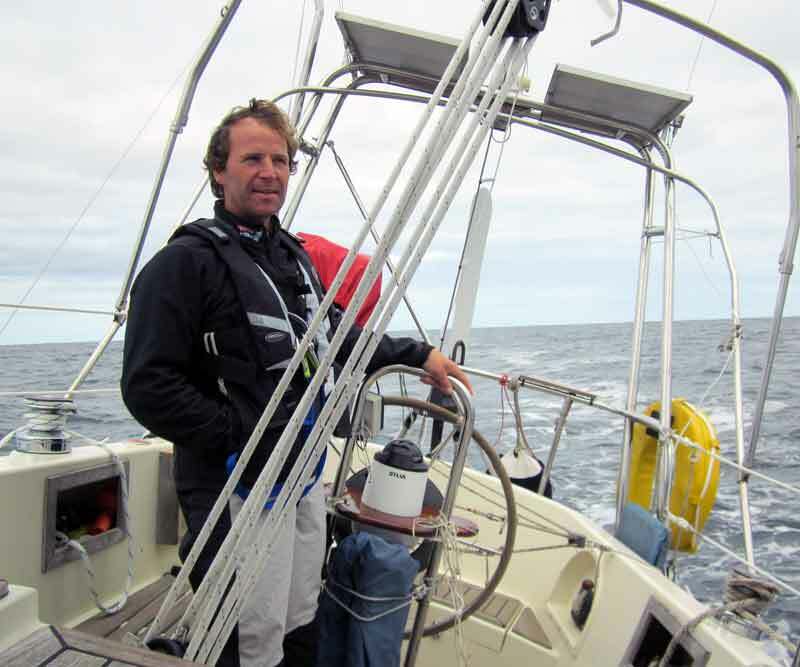 For the first couple of days the winds were from the west and light or moderate so we made as best we could, tacking to avoid getting too close to the Ushant traffic separation zone. Once out of the English Channel it felt as if another milestone had been passed: with that special sense of freedom that comes from being in the open ocean. 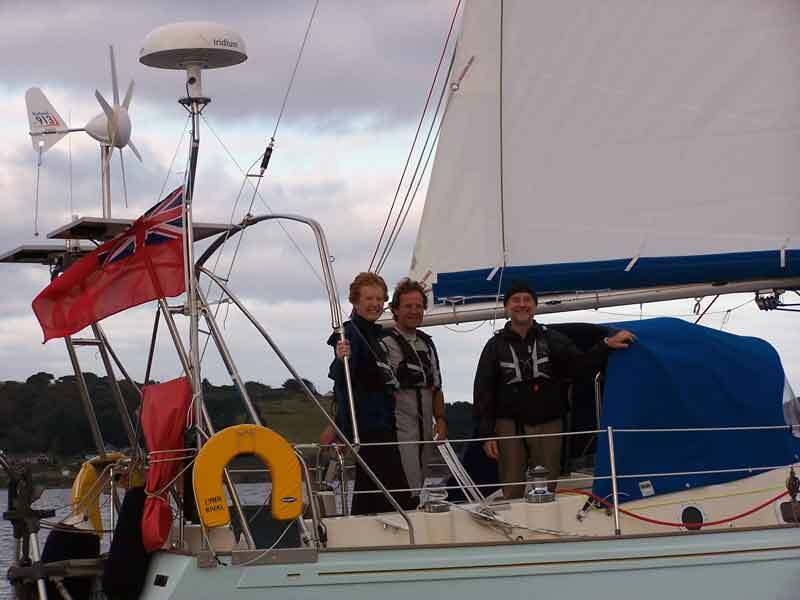 For Rachel it was a first, never having sailed west of the Helford river. But we were not alone. Shipping is ever present across Biscay. Having been sceptical about yet another bit of kit to find space and power for we soon found the AIS set a boon. Even though the conditions were good and we could spot ships by their lights, having information about their course and speed is very helpful and reassuring. Of course, not all vessels transmit AIS signals so you still have to keep a good look out, especially for warships which don't announce their presence and fishing boats that go round in circles and shine bright lights that spoil your night vision . The second night was murky and, in a patch unusually clear of shipping, we heard the roar of an engine. Rachel, on watch, saw flashing lights approaching us fast. Scary. It turned out to be an aeroplane, military or reconnaissance, that flew low over us, circled around, did the same thing again and then went away. 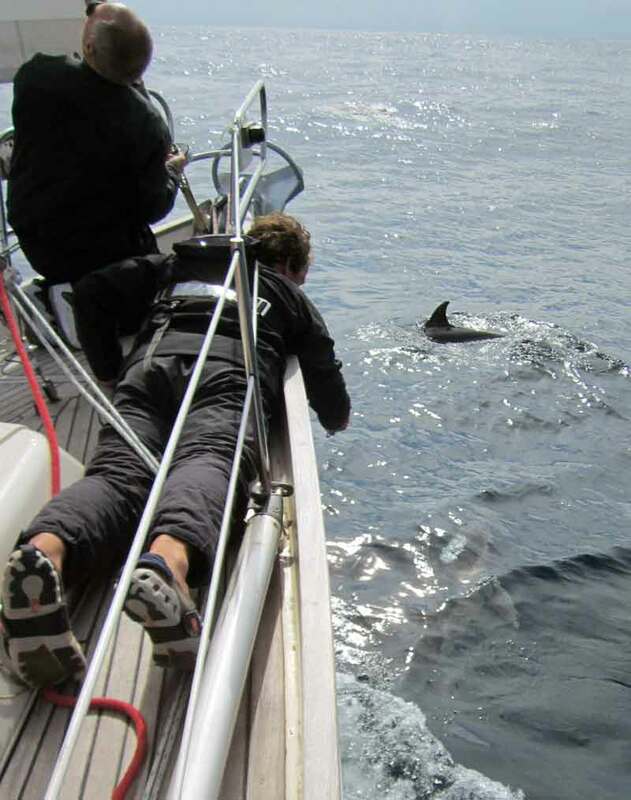 More welcome visitors, both day and night were dolphins. We saw pods of dolphins most days, in both light and heavy weather. We also saw a pair of Minke whales. Less fun but special. On Monday we spotted a problem with the genoa furling gear. One of the joints in the foil was opening up and threatening to tear the sail. We would risk severe damage to the sail if we did nothing about it but we didn't fancy tackling the problem while rolling wildly in the middle of Biscay! 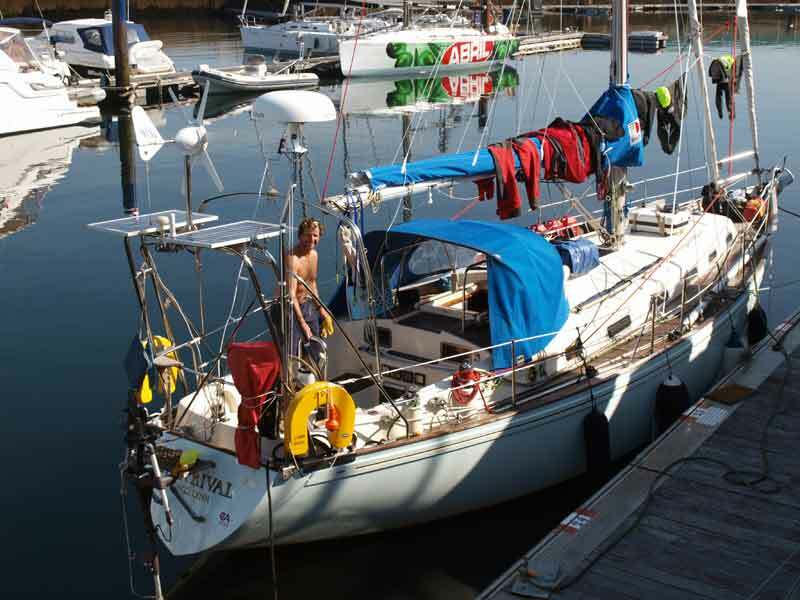 We decided to furl the genoa enough to protect the sail and not unroll it fully while at sea. If the winds had remained light it would have slowed us down; fortunately the meanderings of Nadine ensured that they didn't. In the early hours of Tuesday the wind picked up and veered to the north. We were reaching along nicely, still under full main and reefed genoa. The skies were often clear and starry at night. We were on course for Cape Finisterre - the south-western end of the bay. Wednesday was a wet day. After heaving to at first light in order to put two rather overdue reefs in the main we were making fast progress in a northeasterly force 6, occasionally 7, but the seas were rough so we were regularly doused with seawater. 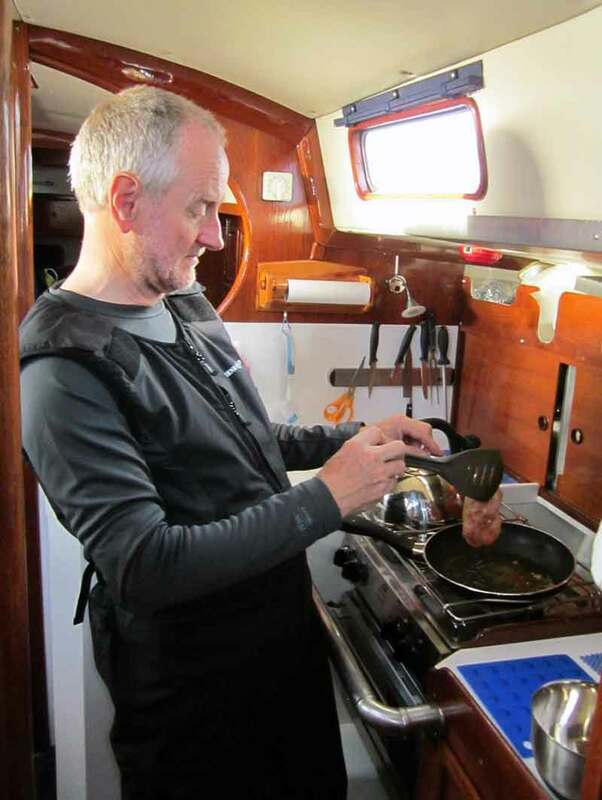 Three layers of gear kept us warm and dry, provided we remembered to pull on our hoods before the rogue wave broke, but no amount of organization makes it possible to keep the boat shipshape and cook meals when it's being swept up and down, side to side by the waves. Cooking breakfast. Bacon omelettes. Soon after the bowl of eggs fell over. After a day or so of being bounced around we were glad to reach the shelter of Cape Finisterre where the seas were calmer. (Remember we had easterlies rather than the prevailing westerlies - thanks to the intense depression over the Azores previously known as tropical storm Nadine.) We had hoped to call in at one of the Rias just south of Finisterre but would have had to make a night entrance - something we prefer to avoid. We decided to carry on to Vigo, especially as we needed to attend to the genoa furling gear problem. Overnight the wind was variable but we were still making good speed and looked likely to reach Vigo before dawn so we fully furled the genoa, gently closing in to land as the sun was rising. Just after dawn we berthed in the Real Club Nautico marina right in the heart of Vigo. Both genoa and staysail have been taken down, furling gear sorted after a few sorties aloft and some raiding of the Lynn Rival stores (well - we do have two Engineers on board), sail thankfully not damaged.